Since moving into an apartment solo, I’ve had so much fun putting together a colorful apartment with special pieces and things I collect overtime. I’ve also found a real passion for hosting wine nights with friends and love having the right utensils on-hand to be the best hostess possible. 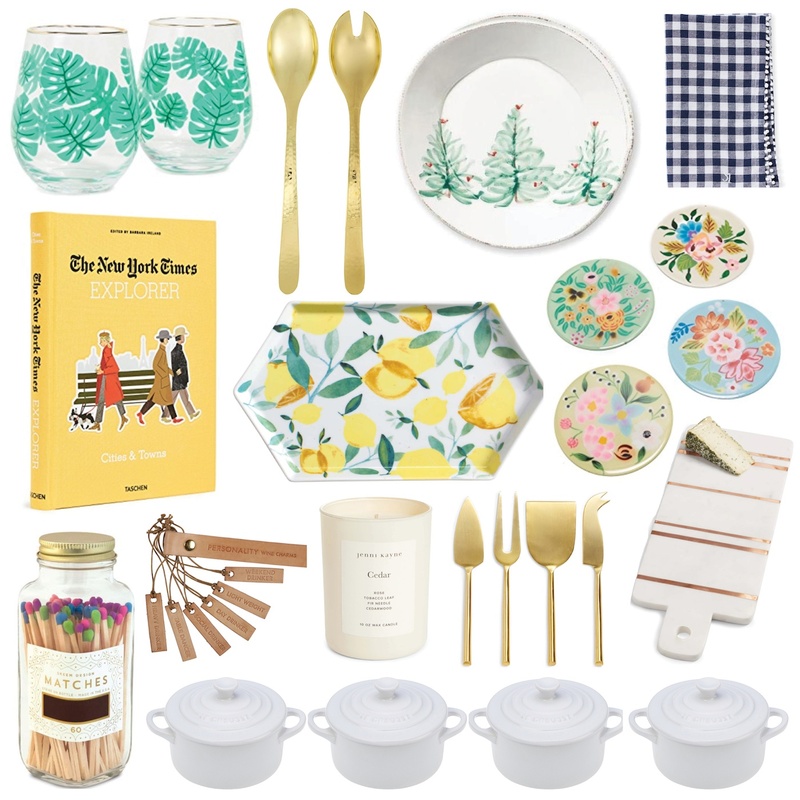 I tried to keep these two passions in mind when putting together this gift guide for the home today! Don’t forget to check out my other gift guides, including my Christmas list and the things I love for travel! 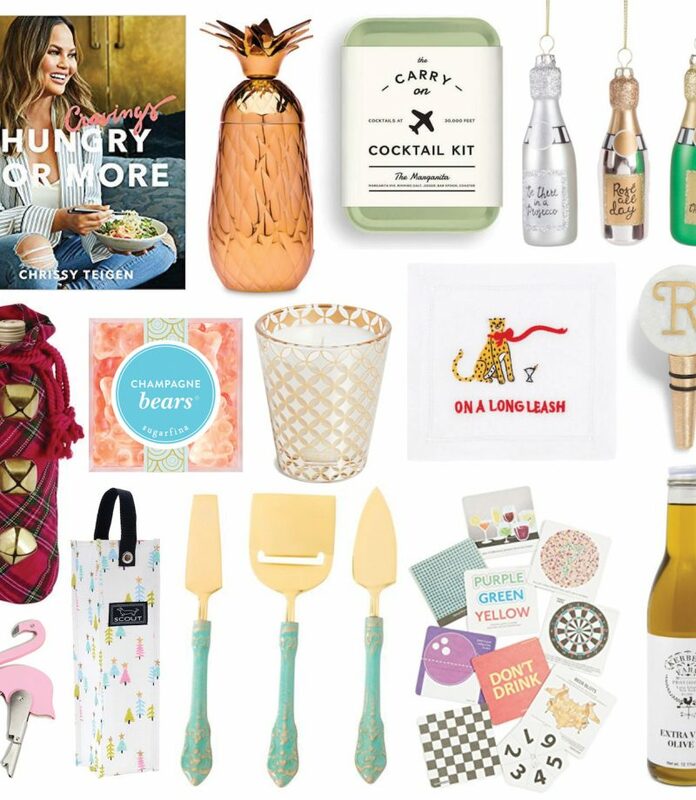 My gift guides from last year can be found here if you need even more inspiration. For my birthday last year, Monica gave me a beautiful set of pineapple salad servers and I thought they were the most thoughtful gift—and very useful! This set from Nordstrom is a classic gold and at a great price point. I collect coffee table books as a way to express my passions and also easily intersperse color throughout my apartment. This New York Times Explorer: Cities & Towns book is right up my alley—and, as someone who owns a few NYT travel guides, very useful! You can never have too many coasters at home and I love these floral ones. While I was in St. Michaels, Maryland earlier this year, I picked up a pair of stemless wine glasses with a palm leaf print—and this pair is so similar! These would be so fun to whip out at a wine night or cocktail party! These mini Le Creusets are so cute—my friend Emma has a set of four, and they are perfect to make mini desserts or mini savory pies in for parties. At $20/each, you could get a set of four for under $100. Every wine night at home needs a cheese board, and I love this marble one because the brass inlays are beautiful. Don’t forget the cheese knives! Home is where the candles burn—and this Jenni Kayne candle smells like Christmas. I recently picked up these gingham Serena & Lily napkins and I love how timeless the pattern is. They are also extremely thick material, so I know they’ll hold up for years to come. How hilarious are these personality wine charms?! I love when something for your home offers form and function—these would be a great conversation starter. I love having trays around my house—they are a great catchall for jewelry, matchbooks, my keys, chapsticks, the like. This lemon tray is right up my alley and would bring sunshine to any room. One day when I have more cabinet space again, I am going to invest in Christmas dinnerware. I am obsessed with this watercolor Christmas tree set from Waiting on Martha—in addition to salad and dinner plates, they also have a variety of serving ware in this pattern. When all else fails, you can never have too many matches—I love this multicolor party bottle. 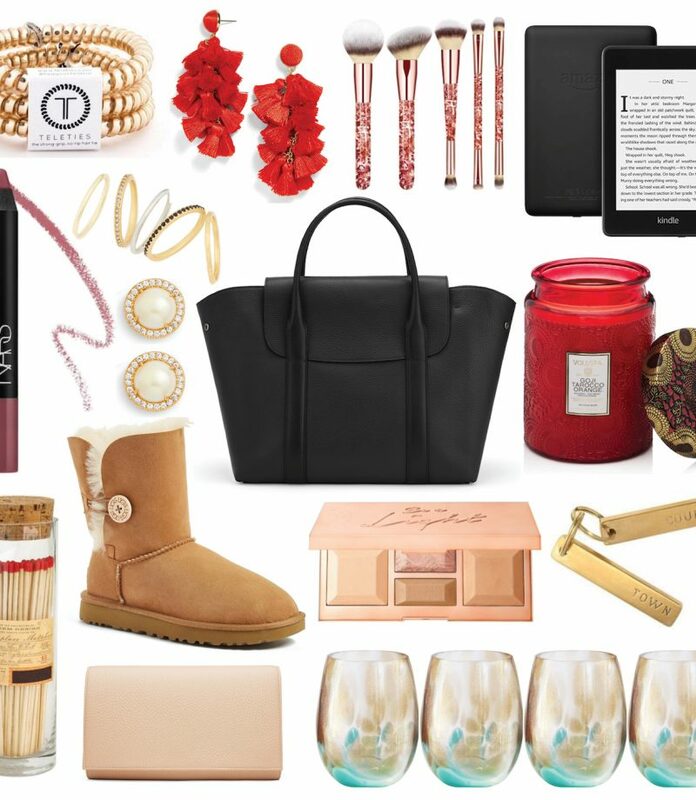 Haha, great minds think alike because several of these items are on the gift guide I have scheduled for tomorrow! Such fun home picks! Great minds, great taste! Just so many good items! love that lemon tray! and the mini le creusets, I also think mini cast irons are adorable. Thank you! I love the mini cast irons, too!